Before I start, I want to signal my deepest appreciation to the people of Auto Zarco (Renault), for the dedication, professionalism, and sympathy in the vehicle delivery, assistance, and pickup process. I couldn’t have expected better customer care! Still, these numbers were a welcome surprise and my subconscious sealed off any kind of range anxiety it could have had then. “Now I know what Tesla owners feel like (regarding range),” I thought. 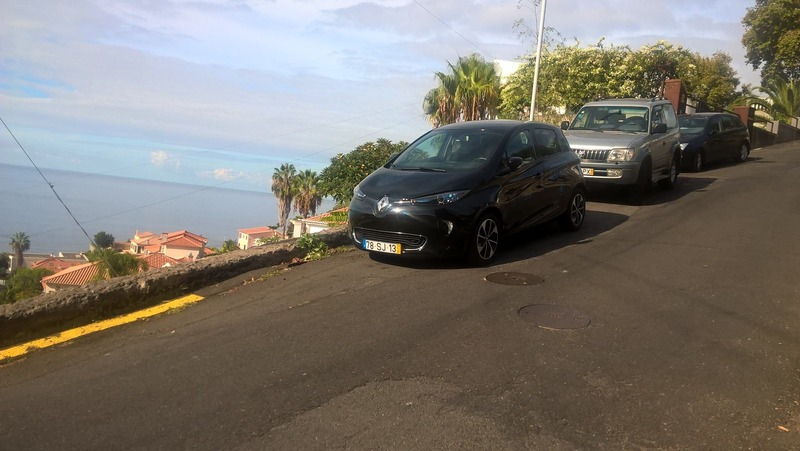 After the first minutes of driving the Zoe in Madeira, I found it to be right sized for the narrow, winding roads and steep climbs outside the capital, Funchal, as well as dense traffic in it. The Nissan LEAF must feel big here, while a Tesla might feel like a giant cruise ship in these roads. Proof of this could be the fact that cars larger than a BMW 3-Series are a rare sight here. 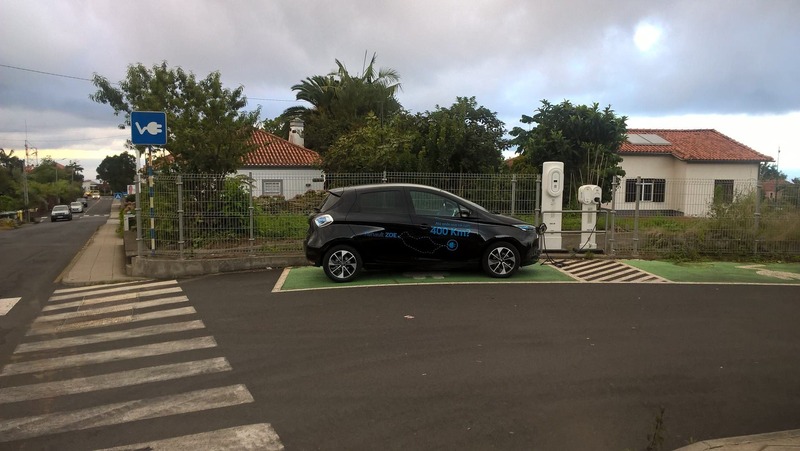 After running around the metro area of Funchal, we decided to charge the car, not because it had low charge (it was at 96%), but because of the free parking and reserved spot next to the downtown area and the marina. 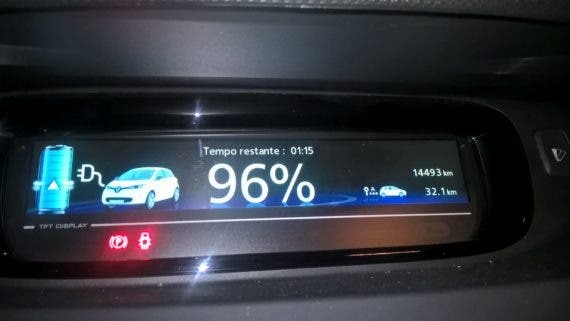 After a nice dinner and a few drinks, we went back to the car and it had a full charge, showing 590 km of range, or almost as much as my ICE car has on a full tank. First stop was Formosa beach, where the GPS (or was it the driver? Hmm…) led us to a narrow dead-end street with no possibility to change direction, so we had to go backwards for one kilometer, in a 15% slope and 50-degree curves. Fortunately, the Zoe was up to the task, the rear camera and sensors were precious to help guide me in the back. Although, I wish it had them also in the front — good thing at least that the Zoe has a short hood! After this scare, we started the tour for real — Formosa beach, Girao cape, Calheta beach…. 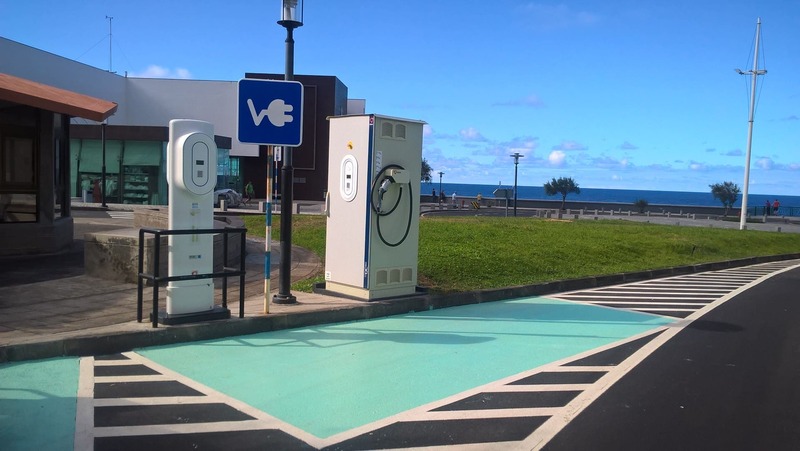 We parked the car at the local charging station, which is ideally placed (at the beginning of the beach) and includes Type 2, CHAdeMO, and schuko plugs. 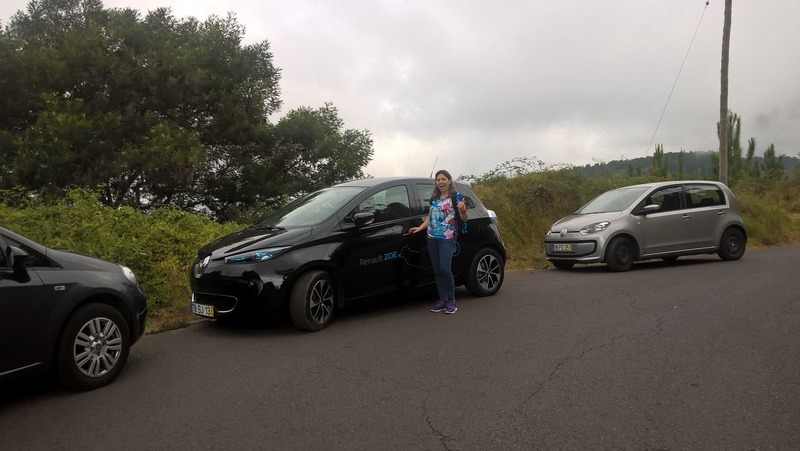 Because the Type 2 plug had another Zoe charging, I had to settle with the schuko, but then again, because the car was still showing over 400 km of range, my interest was more on the free parking than on actual charging. “Range anxiety? What range anxiety?! ?” – I thought, while smiling. Me: If you’re careful with your driving. Admirer: That’s great! It’s enough to tour the island twice! We headed to the north side of the island to see the natural swimming pools of Porto Moniz. After what seemed like dozens of tunnels (I remember only seeing that many in Norway), we finally arrived there and parked at the local charging station, because of … you guessed it, free parking. “Man, I wish all charging stations were as neat as these ones,” I mumbled to myself. With the Type 2 plug charging at only 3.6 kW, the hour and a half wasn’t enough to fully recharge the battery, but it did give a nice bump in the range. Not that I was worried about that, as the range meter never once dropped below 200 km during the entire road trip. 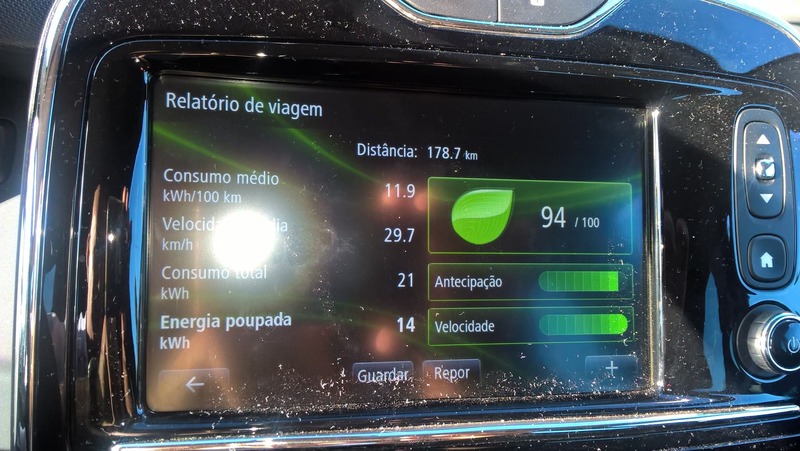 After doing a travel report, I was surprised to see the low consumption (11.9 kWh/100 km), especially considering we had crossed over 1000-meter mountains and rarely used the “Eco” button, with the only efficiency concession being a sparse use of air conditioning — with air temperatures ranging from 19–25°C, it was not a real necessity. Back on the road, on our way to the Santana straw houses and while noticing the differences between the two sides of the island (banana and palm trees on the south side, versus eucalyptus and pine trees on the north side), the tunnels stopped and we had to settle with old mountain roads, where two cars crossing each other could be an event. The constant ups and downs allowed us to use regenerative braking to the max, recovering downhill most of the 50 km we lost on the way up. In Santana we stopped at the local charging station (first-generation EV driver reflex — charge whenever possible). It was close to the hay houses, so we took some pictures and a short walk. We returned to the road as rain started to fall. 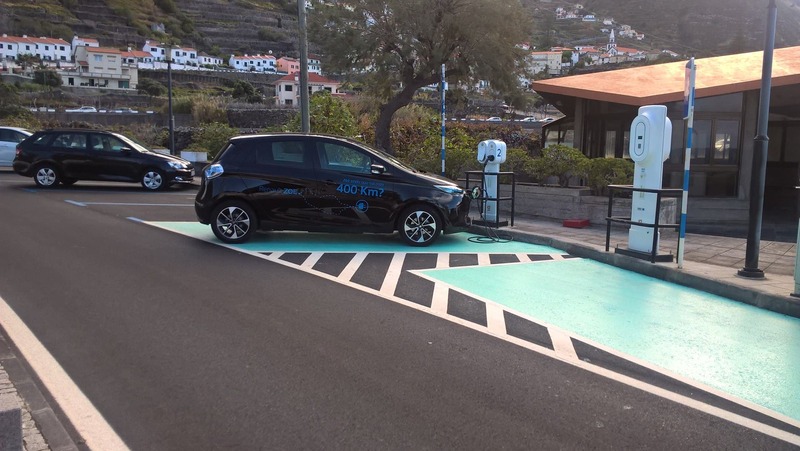 Having returned to Funchal by dinner time, we zoomed to the local charging station, where another Zoe was charging. Despite still having 280 km of range, we plugged it into the other Type 2 plug. We started the last day visiting the eastern tip of the island (S. Lourenço), possibly the most unspoiled and wild part of the island, then we went south back to Funchal, visiting the villages on the way. 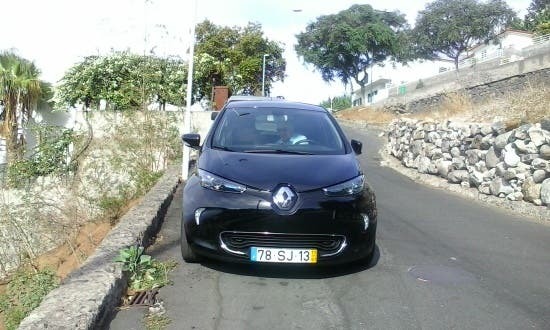 Anyway, after an afternoon spent watching dolphins and whales at the sea while the Zoe was parked — I mean, charging at the Funchal charging station — we returned our loaner car to Renault, leaving it with an extra 300 km on the odometer and still 265 km of range. But what really surprised me was the final travel report. 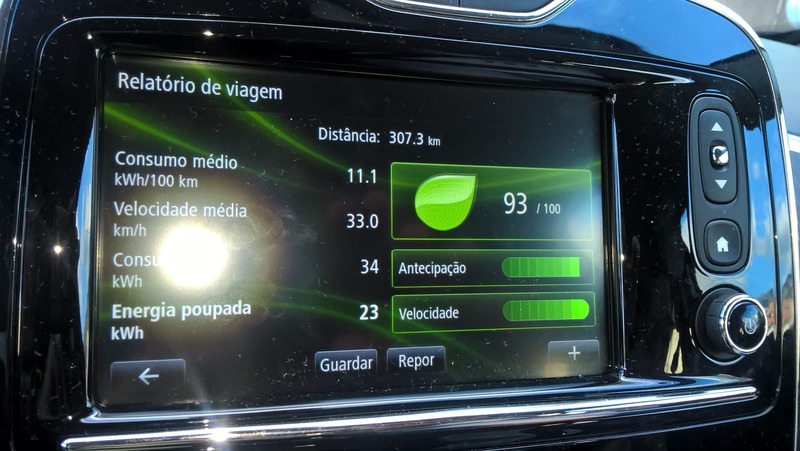 Without really trying hard to be efficient, the Zoe did 11.1 kWh/100 km. Translating that into range on one charge, it would be enough for 360 km of driving. 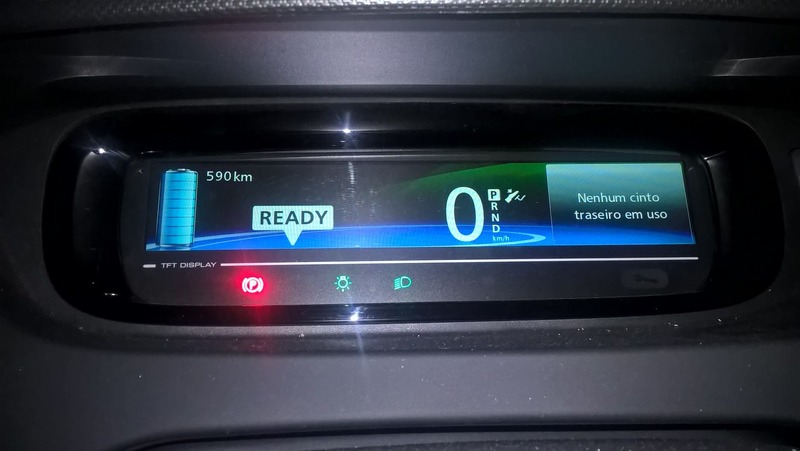 Still not the 400 km announced by Renault (NEDC system), but not very far off. 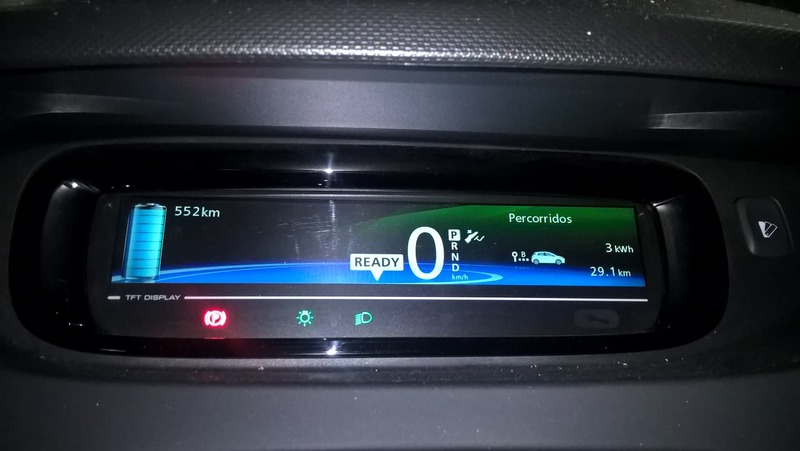 I bet if I had used the “Eco” button all the time, never turned on the A/C, and driven it like a nun, I could have reached the 400 km mark … not that I would want to. That’s the thing with the NEDC standard — it’s not impossible to reach it, but the problem is that you must drive in ideal conditions and use a very granny Zen-like driving style. Thank God for the new WLTP standard. I’d rather beat the announced range than be constantly getting lower-than-announced range measurements. No Range Anxiety. 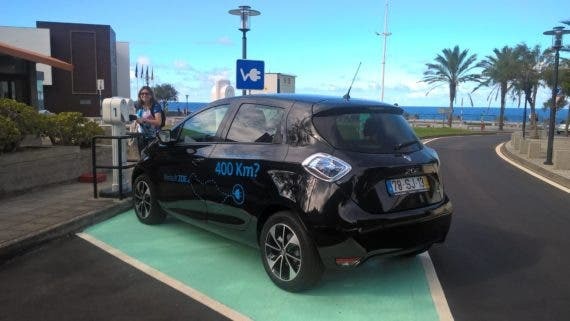 I already anticipated that the long range of the Zoe would allow a stressless trip around Madeira, even without the possibility of overnight charging. What I didn’t expect was that it was so easy to forget about the range while travelling, something first-generation EV drivers know can turn into stressful moments. Driving the Zoe was basically like driving a regular gas car. We never had to change our scheduling for charging. Most times I only charged it as an excuse to have free parking. I’m sure many mainstream EV buyers will appreciate this unique quality of the Zoe. Space Efficiency / Maneuverability. It is a small car, but it doesn’t feel like it on the inside. Because the battery pack is on the floor, interior space is maximized and the trunk is surprisingly big for the size of the car. While inside, you only realize the small size of the Zoe when profiting from the small turning circle, parking, or doing other stunts … like going backwards in a narrow, winding road. Power Availability. When the model came out a few years ago, I was a bit underwhelmed by the low power (88 hp) of the Zoe, but the truth is, while it’s not an Usain Bolt–like sprinter like the BMW i3 or the Chevy Bolt, it never really felt underpowered. Even up against steep 20% climbs or crossing over high mountains, there was always enough power to satisfy the driver, even at stoplights when you wanted to behave like a hooligan and charge forward ahead of everyone else…. No Fast Charging. Having received the car with a full battery, this was never an issue on my stay, but I thought it could be if by any chance I would have got it with an empty battery and little to no range. With a 22 kW AC charging rate (when available — the ones I charged at only had 3.6 kW of power capacity), it would have taken hours to charge such a big battery, forcing us to change our touring schedules. 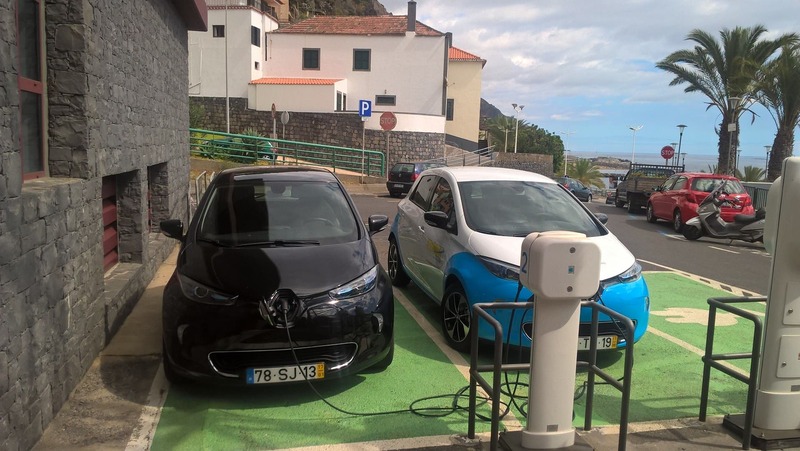 On the other hand, from a broader view, the availability of the 22 kW AC charging allows you to charge the ZOE in fewer than 2 hours and 40 minutes from an empty battery to a full charge in a domestic 32A spot if you have a 22 kW wallbox station (EVSE). Other products on the market are confined to an average 6–11 kW Type 2 charging option and take more than 6 hours to charge. The Zoe’s ability to charge at home (or at public 22 kW chargers) faster than its competitors is one major reason why the Zoe is so popular in Germany, where 22 kW charging is commonplace. Some Ergonomic Details. The major gripe I had was the lack of a proper place to put the cables. I was not asking for a frunk a la BMW i3, but something like a hidden loophole like the one that the Kia Soul EV has would be most welcome to avoid having the cables sharing the space with whatever we had in the trunk. There were also other, smaller things that could have been better placed, like the “Eco” button. Its location on the center console forces the driver to divert attention from the road. And why is the back seat only foldable completely and not 60/40, like in most cars? Sure, these details are not deal-breakers, but they also wouldn’t have cost a fortune for Renault to solve, leaving some rough edges to the overall experience, which was quite pleasant in general.